On December 17, 2017 the Arab News published this story with information about women driving. The graphic showing the economic benefits is very powerful, and I agree with the assessment that on an economic basis alone, the change in the law makes good sense. It will encourage families to start small businesses and also to circulate money inside the kingdom rather than sending it abroad. A link to the story is here and the story is pasted in below. JEDDAH: The General Department of Traffic (GDT) and commanders of road security forces have prepared everything needed to enable the GDT to perform its duties when women start to drive in the Kingdom. The Saudi Press Agency (SPA) published answers offered by the GDT to many questions regarding procedures and regulations relating to implementation of the decision allowing women to drive. Valid driving licenses obtained from the Gulf Cooperation Council (GCC) can be replaced by corresponding Saudi licenses, the GDT said. Holders of valid and recognized international licenses will be exempt from a driving test. Foreign women visiting Saudi Arabia can use their recognized licenses for one year in the Kingdom as long as they remain valid. The minimum age for receiving driving licenses for private cars or motorcycles is 18 years, while the minimum age for receiving licenses for public transport and public work vehicles is 20 years, the GDT said. Seventeen-year-olds can get provisional licenses for one year only. Women can work as civilian personnel at road security checkpoints and security control jobs, the GDT said, adding that this is not a new development because women have previously been employed at checkpoints at entrances to Makkah during Hajj. The task of women working at security checkpoints and patrol centers will mainly deal with violators and road users as requested — such as checking IDs, inspections and arrests — with the possibility of being transferred in the future to the uniformed police force after undergoing special training. Regarding traffic violations or accidents involving female drivers, the GDT said there is coordination between the ministries of interior and labor and social development to use women care centers as detention centers if necessary. Recruiting foreign women to work as drivers is subject to the regulations of the Ministry of Labor and Social Development, the GDT added. There will be no discrimination between male and female drivers, the department said. Women will be allowed to drive trucks and ride motorcycles as long as they meet the stated requirements. They will not be prevented from driving outside cities and towns, and cars owned by women will not be issued special license plates or special numbers. 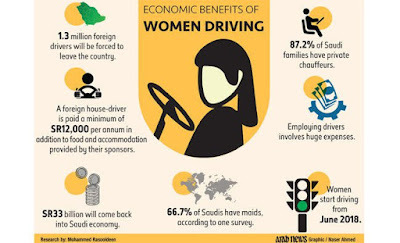 As the weeks pass and the time approaches for Saudi and other women living in Saudi Arabia to begin driving legally, word has come out that women will be able to drive trucks and motorcycles too. Non-Saudi women with international drivers licenses will be able to take to the wheel for up to a year from the date the new law goes into effect in June, 2018. A link to a December 17, 2017 story from the Saudi Gazette is here and the text is pasted in below. Note: rural women in Saudi Arabia have driven trucks and cars for years, where there families and local communities long supported it. JEDDAH — Women will be allowed to drive trucks as long as they comply with traffic regulations, the General Directorate of Traffic announced on Friday. Women will also get licenses to ride motorcycles as per a Royal decree announced in September, which comes into effect in June 2018. The General Directorate of Traffic stated that women with international driving licenses will be allowed to drive in the Kingdom without the need to go to local driving schools. Women with licenses from Gulf countries can convert these to Saudi licenses. Women visiting the Kingdom with international driving licenses will also be able to drive for one year before needing to apply for a Saudi license. If an international driving license expires in less than a year from the date a Saudi woman arrives in the Kingdom, she will need a Saudi driving license before the expiry of her international license. The General Directorate of Traffic said it complies with strict anti-harassment laws that will not tolerate any harassment of female drivers. Women will be employed at different traffic checkpoints. The General Directorate of Traffic will also recruit women field inspectors. The directorate has also cooperated with the Ministry of Labor and Social Development to make arrangements for women who violate traffic laws to be detained at women care centers. There will be no discrimination between men and women when it comes to implementing traffic laws and regulations. Licenses to drive vehicles in private and secured areas are granted at the age of 18 and licenses to drive in public areas and to operate public service vehicles are granted at the age of 20. In a historic decision, Custodian of the Two Holy Mosques King Salman on Sept. 26, 2017, issued orders to grant driving licenses to women in the Kingdom. The Royal order will come into force on June 24, 2018. The King directed Minister of Interior Prince Abdul Aziz Bin Saud Bin Naif to constitute a high-level ministerial committee to carry out studies about the necessary arrangements to implement the Royal decree. The committee will comprise representatives of the ministries of interior, finance and labor and social development. The December 6, 2017 Arab News reported the following. A link to the story is here and the text is below. JEDDAH: (December 6, 2017) Saudi daily Al-Watan, according to its sources, said that the number of driving licenses obtained by Saudi women from the UAE, Bahrain and Jordan has reached 7,550 licenses with a total cost of SR11.627 million ($3.1 million) — or SR1,540 for each license. The women obtained their licenses after attending training courses for 22 hours, as well as passing compulsory tests. Imam Muhammad bin Saud Islamic University (IMSIU) in Riyadh organized the first forum on women’s driving, with female members of the Shoura Council, to discuss the importance of driving for women. The forum will be followed by workshops at the university to educate female students and raise their awareness about driving. The decision to allow women to drive in the Kingdom will come into effect in June 2018. The spokesman for (IMSIU), Ahmed Al-Rakban, told Al-Watan: “We appreciate what the university has been doing for women who will start driving next year. An agreement has been signed between the university and the General Department of Traffic in this respect, and the director general of traffic visited the university and discussed the issue with many engineering and safety specialists,” Al-Rakban said. Al-Rakban also noted that driving schools for women have been established at many universities, and there may be other schools outside universities to enable female students and staff to easily get their driving licenses.